A hair transplant is the most popular cosmetic treatment for men. It is a relatively straightforward and safe procedure. Given the advancements of hair transplants carried out now and those carried our years ago, the results can be most impressive. The old hair transplant procedures often produced the dreaded dolls head effect which people still associate with a transplant. This method should never be used nowadays. A modern-day hair transplant is extremely discrete and virtually impossible to detect. A hair transplant is a relatively simple straightforward procedure that involves the transfer of hair follicles from the donor site, usually at the back of the head and then transplanting the follicle to the balding or the required area of the scalp that is considered to be thinning. 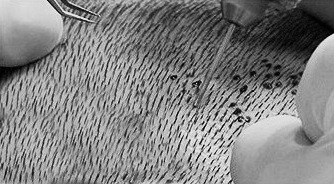 Strip harvesting is perhaps the most common technique for harvesting follicles and from the patient’s donor site. The surgeon will harvest strips of skin and follicles from the rear of the scalp in an area of good healthy hair growth. With the use of a single or triple-bladed instrument, he will remove complete strips of hair tissue with the follicle attached from the donor site. The surgeon then carefully trims the follicle strip and removes any fatty tissue while avoiding any damage to the follicular cells that will then be used for grafting. The surgeon then proceeds to use fine micro blades or needles to puncture a hole in the recipient site ready to receive the grafts, delicately positioning them in a prearranged thickness and pattern and angles the hairs in a constant fashion to help achieve a realistic hair pattern. This is where the surgeon’s skills are needed to make the hair styling appear natural. The strip harvesting procedure normally leaves a fairly thin scar in the donor site, which can normally be covered by a patient’s hair. The normal recovery time for this procedure is around three weeks and will require the stitches to be removed by medical personnel at a later date. The Follicular unit extraction procedure is a nominally invasive technique for hair transplants. Nevertheless, the follicular unit transplant procedure differs because a strip of donor tissue is slowly removed and dissected under very high magnification, the FUE method utilizes a small punch instrument to remove follicular units individually. Follicular Unit Extraction involves the extraction of from one to four hair follicular units individually by means of a miniature punch. The tiny hole left behind on the donor site after the hair follicle has been extracted should then completely heal over the following week. Usually, the small incisions contract as they heal therefore making the resulting scar a bit smaller in comparison to the size of the specific punch that made the incision. The FUE patient ultimately finishes up with a huge selection of tiny round white scars, that are normally not detectable after the patient’s hair grows out. The key distinction between both of these procedures will be the technique utilized to harvest the follicular unit grafts. Whereas, FUE is a much longer consuming process–the follicles of hair are removed individually from your donor area, leaving tiny dots that have a tendency to heal in one week, this technique will not leave a scar after extraction. FUE is a non-invasive treatment, carried out under local anesthetic with the patient aware what is happening all the time and quite often just reading a book or viewing television. With FUE procedure stitches usually are not required after treatment. Thus time to recover is incredibly reduced when compared to FUT surgery. With FUE procedure it requires higher surgical times and therefore a greater cost for the patient. Some surgeons will always make the point that FUE can result in a reduced ratio of the successfully transplanted follicles when it’s in comparison to strip harvesting.